but the very next day, you threw it away. "[Saint Lucy's] feast once coincided with the Winter Solstice, the shortest day of the year before calendar reforms, so her feast day has become a festival of light.[...] In Scandinavia, where Lucy is called Lucia, she is represented as a woman in a white dress and red sash with a crown or wreath of candles on her head. In both Norway and Sweden, girls dressed as Lucy carry rolls and cookies in procession as songs are sung. Boys take part in the procession as well, playing different roles associated with Christmas. It is said that to vividly celebrate St. Lucy's Day will help one live the long winter days with enough light." 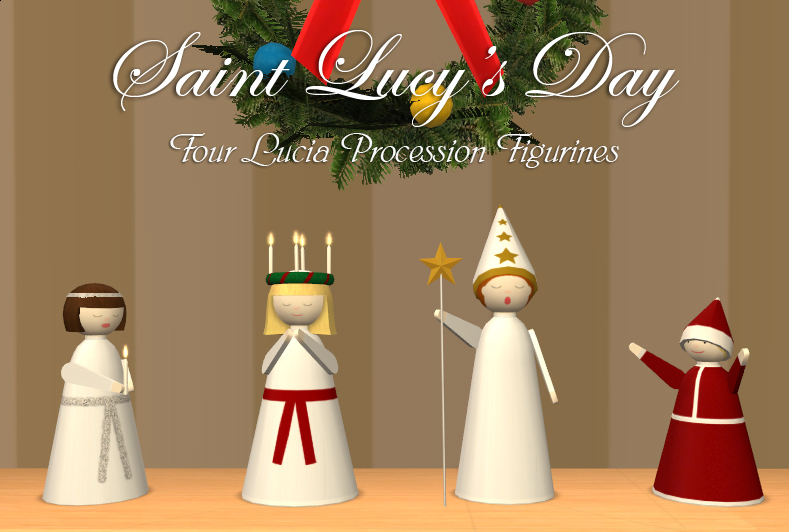 Now your Sims, too, can have a Lucia procession! The figurines aren't just decorative, though: They all play the "Santa Lucia" song, and your Sims can listen to it whilst it plays. Oh, and the figurines are animated. They're all found in Deco -> Misc. for $25. Poly counts range between 912 (Lucia) and 468 (Brownie). Note: The set is base-game compatible, but you need to have OFB or above in order to hear the music. (Maxis' fault, not mine. ) Your Sims can still listen to the music if you only have UNI or NL, though, only you the player won't hear anything. Have a very herring Fishmas! 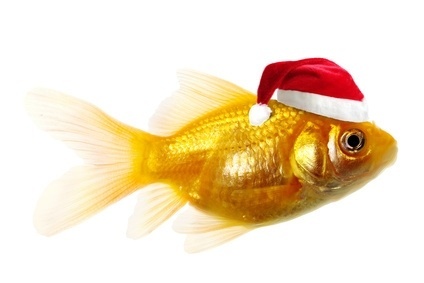 Thank you SantaFish, and all your guppy-helpers. Possibly the MOST adorable thing ever! How cute. I cant wait to hear it!! Oooh! Thank you, SantaFish and Santa's fishy helper! This is adorable. Thank you very much!